What is Awareness Through Movement class? 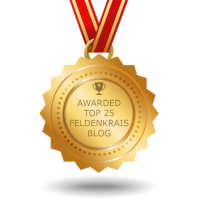 I'm a certified Feldenkrais Awareness Through Movement (ATM) teacher. Whenever I tell people about ATM, I get asked what ATM is. I've always struggled to explain it to people for several reasons. ATM is kinesthetic learning, which means you learn by feeling/sensing/moving and you must experience to make sense out of ATM. But, it also helps to put it into words so people can understand cognitively. Many ATM lessons are based on developmental movement especially first 2 years of our lives (learning to flex/extend our head/torso/limbs; learning to roll; crawl; sit; stand; walk, etc). Reasons why we teach developmental movement patterns are that as we get older, we tend to lose the coordination of head-torso-limbs and become more compartmentalized. As a result of poor coordination, certain parts get used much more and certain parts hardly get used. Uneven distribution of stress to the body can become a problem. Practicing developmental movement can restore the coordination of all body parts and re-distribute effort/stress more evenly. Another reason is that babies learn by sensing/feeling/moving (kinesthetic learning) vs by thinking (cortical learning). In ATM class, we (ATM teachers) guide movements only verbally. We purposefully do not show movements to students because we try to direct their attention/awareness into their body and movement so they can tap into their own kinesthetic sensation just like all babies do. When you are tuned into your own kinesthetic sense, you start to become aware of your habitual patterns. You not only become aware of your habitual patterns, but you also discover new options. Do you remember the first time you rode a bicycle? It probably didn't go so smooth, did it? You probably fell a few times and got a few scratches on your arms or legs, right? So, how did you learn to ride a bicycle? Probably not by reading a manual. Probably by lots of trials and errors. This is an example of kinesthetic learning. ATM class creates a similar experience where you focus on feeling and sensing your body while exploring movements and start to move towards more efficient movement patterns. The emphasis on ATM is to improve "Awareness" through Movement; thus the name ATM. Come join my ATM classes to have kinesthetic learning experience!